I would say I eat mexican food about 2-3 times a week, go through about 2 bags of chips, and a large container of homemade salsa a week. This is a normal week. There have been times where I’ve eaten it 3-4 days in a row, and when I actually worked in a mexican food restaurant and ate for free…well…you get the point. 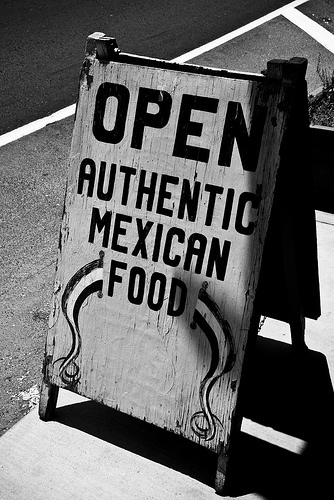 No other cuisine touches every inch of my taste buds like mexican food does. I absolutely love spicy food, so the more peppers there are…raw, cooked..doesn’t matter to me..the better!Aside from cooking my favorite dishes at home we eat at more mexican food restaurants than any other type of cuisine. Aside from mexican, sushi is pretty much the only other food we eat out. I cook a lot of Italian at home, mainly because it’s sooo much healthier when you do it yourself. Hamburgers, chinese, all of the above…we just don’t eat as much as we do mexican food. We were going to make Cinco de Mayo the day we ended our two week fast, but due to work schedules we pushed it up to Monday (you’re not seeing me complain here). So in honor of my test of self control I’ve decided to post my top 10 favorite mexican food spots in the DFW area. I know there are a lot of fantastic restaurants out there that are probably not included on my list….I just can’t get to them all…so leave a comment and tell me what your favorite mexican spots are. Before we get to the list I should probably give a quick update on my weight loss. Along with no mexican food, we’ve eaten a lot cleaner (non-proccessed, fresh foods) and reduced our portion sizes overall. I wanted to work out about 5 days a week, but realistically, I was able to squeeze in around 3-4 days of exercise per week. I lost around 5 pounds (I’m not done yet), and overall my body feels lighter and more fit. I didn’t realize how many carbs I was consuming every day. I’m not a big believer in no-carb diets, but a little self-control goes a long way. Cons: Deal Breaker – Salsa. I am not a fan. It should be called a side of pico de gallo instead of salsa. It lacks depth of flavor and that kick salsa is suppose to bring. Too bland for me. Overall, Chuy’s is just okay to me. The food is good but in a city full of options, Chuy’s doesn’t necessarily stand above the rest to me. Since I’ve only been here once it landed in the ninth slot, but no bad comments here. The chips and salsa were spot on and the chicken Fajitas were full of flavor. I will definitely be coming back. Great atmosphere too! Pros: Best Brunch in Dallas! Cons: Can’t think of any right now! Blue Mesa has the most amazing brunch. Their authentic southwestern cuisine is a bit different then most Tex-Mex restaurants, but the different flavors mesh perfectly to create unique mexican style dishes. La Hacienda Ranch is known for their steak fajitas, delicious they are, but depending on the visit they can be drowning in oil. I like to get the Fajita Lights (served with a heaping amount of veggies), but I don’t like picking up a piece of broccoli that’s dripping in oil. Great chips, salsa, guacamole, and margaritas though!! Cyclone Anaya’s is on the higher-end of mexican food dining, but some of their splurge worthy dishes is what makes this hot spot, well, hot! Hands down they have the best margaritas. One large rita will do it for you, and that’s good because they are $$$, but don’t worry, where you would drink three margaritas for the same price, one at Cyclone’s will leave you feeling like you drank three! The Lobster Enchiladas are to die for. So fresh, creamy, and FILLING!!! But please stay away from the Crab Omelet…one word…GROSS! Cyclone’s also has a pretty decent brunch, but I would come here more for the bottomless mimosas (very tasty) before I would the brunch. El Fenix is one of the oldest restaurants in Dallas and it is truly authentic (specifically the Downtown location). From their famous salsa, yes I do keep a bottle in the fridge, to their delicious top shelf ritas, I leave full and happy every time. The Martinez Plate is the absolute BEST combo platter, with a crispy taco, enchilada, and guacamole tostada, it doesn’t get any more Tex-Mex than this. Great atmosphere, great good, great all the way around! Gloria’s is one of those places that I just simply have to stay away from. From their amazing crispy flautas, to the bottomless black bean dip served with the chips and salsa, it’s so easy for one to just eat enough for a small army. The food is absolutely delicious and the frozen Mambo Taxi is a perfect start to any meal. I’ve talked to a lot of people that do not like Mi Cocina, and honestly, I don’t understand why. The chips are that perfect level of thickness and the salsa hits every note that a salsa should, full of tomato and spicy flavor! The fajitas have nice cuts of meat and aren’t lying in a pool of grease. I love the potato wedges served on top of the meat, and the onions are cooked just enough to still have that perfect crunch. The guacamole is always fresh and the margaritas are always nice and strong without being too harsh (try the Dilemma). The Enchilada’s Modern is my second favorite dish. These cheese enchiladas are topped with a delicious red sauce and grilled to perfection veggies! If it’s dinner time and I’m not cooking up a storm at home…more than likely I’ll be shoveling my face full of Mi Cocina! Taco Diner takes the top spot on my list of best mexican food restaurants. Yes, Mi Cocina and Taco Diner are in the same restaurant group, but they each have their own unique dishes that set these two restaurants a part. The chips are served with two delicious types of salsa, a spicy chipotle style and a tomatillo salsa. The guacamole is AMAZING, so full of flavor and the avocado is unbelievably creamy and delicious! Their mango margaritas are so yummy, and they definitely have a kick to them. The two best dishes are the Enchilada’s con Pollo and Brisket Tacos. The enchilada’s are filled with cheese and topped with chicken, red sauce, and a delicious crema. The black beans and rice served on the side are divine. The fajitas are also amazing. Honestly everything is delicious! There’s a reason Taco Diner is always packed…if you haven’t tried it yet, give it a shot. It won’t leave your taste buds disappointed. La Roux is a pop duo out of London. Their debut album was released last year and their most popular single “Bulletproof” has been blowing up the UK charts and US radio. I love the style and groove of this song. It’s definitley following the latest electro pop trend, and it works. Enjoy! Sarah, great post! Mexican food is my favorite and I would have to argue with you that Mi Cocina is the best in DFW! Love their Enchilada’s Modern. Nice pick on the music as many of us must be BULLET PROOF to take some of these salsa’s! Especially yours and Joshua’s when you have your way with it!! Love Love….